Excellence, curiosity and a great deal of courage. These are the main criteria behind the assignment of the ECHO grants by the Netherlands Organisation for Scientific Research (NWO). Individual awards of a maximum of 260’000 euros which allow creative, risky ideas in the field of chemistry to be pursued. 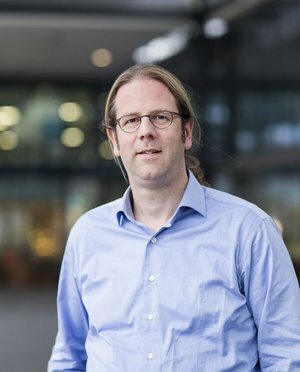 This year, Luc Brunsveld, Professor Chemical Biology at the Department of Biomedical Engineering at TU/e, was awarded with an ECHO grant for his research plans on drug targets based on nuclear receptors. Brunsveld is very happy with this achievement. “The competition is very harsh”, he explains, “with approximately 15 % of the grant proposals being granted every year. So, next to a good proposal, also highly supportive reviewers and a fair deal of luck are required.” The main innovative strength of this ECHO proposal is twofold. With his research, Brunsveld hopes to contribute to early drug discovery via novel small molecule leads and to address an important conceptual need in chemical biology via the molecular understanding of protein modulation. Nuclear receptors (NRs) are a superfamily of proteins found within cells. When small ligands bind to NRs, NRs respond regulating the reproductive system, the development, the metabolism, and many pathological processes. Approximately 16% of all marketed drugs, for example those against auto-immune diseases or cancer, target the NR superfamily and modulate its function. Small ligands typically bind NRs at specific locations called “orthosteric pockets”. Thus, to date, the majority of drugs targeting NRs were designed to bind these orthosteric pockets. However, low drug efficacy due to competition with ligands produced by the body itself, drug resistance, drug toxicity, and low NRs selectivity demand alternative solutions. In this regard, “allosteric” as opposed to orthosteric modulation of NRs holds significant promise, as it in principle overcomes a number of these limitations. “In the context of NRs based drugs development”, explains Brunsveld, “allosteric modulation refers to the ability of a ligand to bind to a different pocket than the orthosteric one”. For Brunsveld, this intuition is the result of a previously published work in Nature Communications, which describes a promising drug target for the treatment of autoimmune diseases. In this work, Brunsveld and colleagues identified a potent inverse agonist of a NR gene transcription factor, which acts through binding to a novel allosteric pocket never before seen on NRs. The ECHO Grants strengthen or renew lines of research from excellent research groups in Chemical Science. These groups can do groundbreaking new research for a maximum of six years. ECHO grants privilege excellent and brave researchers, the “seeds for future scientific innovation”. The grants cover three main research areas: chemistry of life, chemistry of materials and chemical conversion. ECHO grant applications can be submitted every year between November and May. The total budget available for granting is of approximately 7 million euro, every year. More infoat this link. Interested in the research of Professor Brunsveld? Visit his personal page, at this link.